Earlier this week, Beyoncé announced her 21 day vegan diet plan to the world... and her fans were livid that they woke up early to hear it. It was honestly one of the most hilarious days I've seen on social media in awhile. Truth be told, there isn't a celebrity on this earth who could convince me to give up meat forever, or even 21 days. But all jokes aside, I do incorporate plenty of vegetarian and vegan dishes into my diet. They just aren't all of my diet. I love vegetables and I do think they deserve to be the star of the show when at their best. That's why for this pot of beans, you won't see bacon or ham hocks, chicken stock, or even a pat of butter. 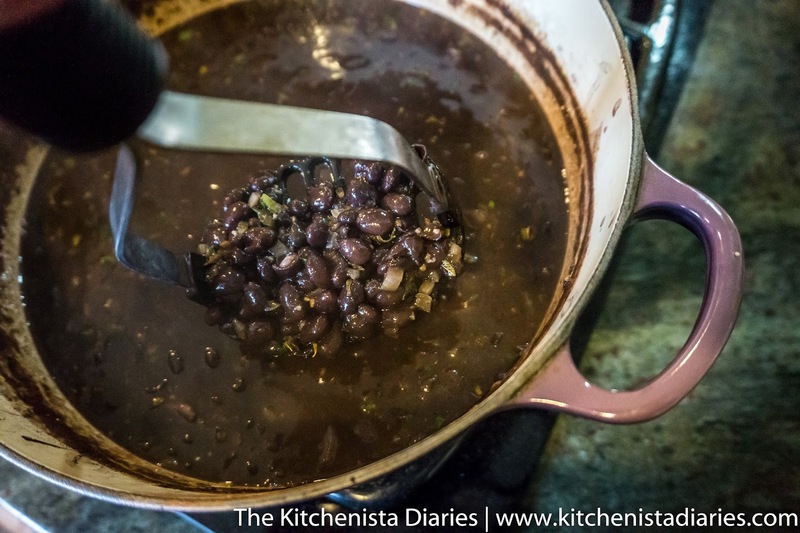 Just good hearty black beans and lots of aromatics. That's really all you need to make the most delicious black beans you'll ever have. Best part? You don't even need to soak them the day before. One of my favorite sources for recipe testing, Serious Eats, has a pretty lengthy discussion about that. Side note: I do understand that some people soak to prevent digestive issues, and if you care to take that step it definitely won't hurt this recipe. I personally found no reason to and love the results, minus the extra prep time! 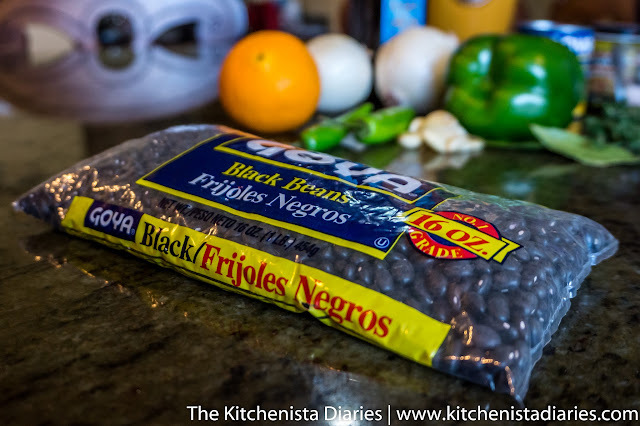 On weeknights, I am not ashamed to open up a couple cans of black beans, doctor those bad boys up with onions, herbs and spices and call it a day. 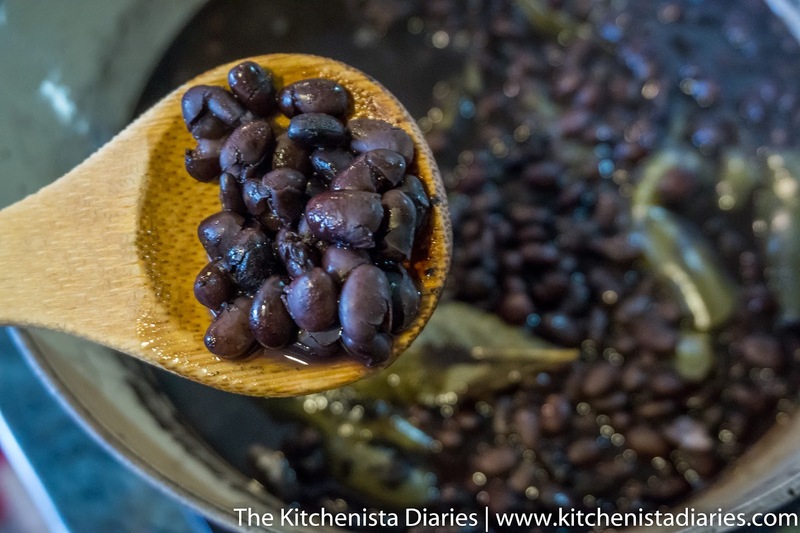 But if I'm honest, canned beans will never compare to a pot prepared from dried beans. That deep, dark rich gravy can't be rushed and neither can the subtle layers of flavor you'll experience. I first fell in love with this style of black beans eating at Cuban restaurants in South Florida. I could live off Cuban black beans and rice, and I'm not even into beans like that. This recipe isn't authentic by any means, as I definitely have my own touches. The style of preparation was influenced by Latin techniques though, and I'd confidently serve my black beans to anybody. My twelve year old son (who doesn't usually extend conversation at the table beyond "it's good") stopped me in my tracks when he finished dinner with, "The beans were perfect, Mom." That's when I knew I would share my recipe. These beans are righteous the day they're made, and they'll get even better after an overnight sit in the fridge, not to mention the next day or two after that if they last. 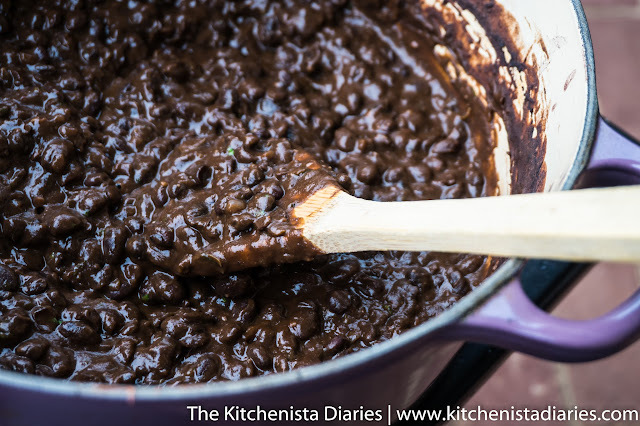 Serve black beans over rice with a little bit of fresh cilantro and lime for the true experience. 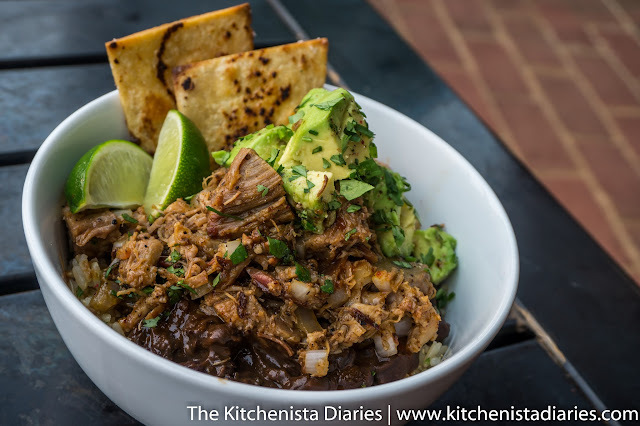 Or...you can wash all your vegan ambitions down the drain and pile the rice and beans with pulled pork. Your choice. When using dried beans, you always want to rinse them off well and pick through for any pebbles, because dried beans can be old and dusty. I want to note that I have not ever actually found pebbles in my beans. 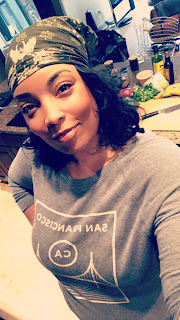 That said, the day I don't take this step I'm quite sure I would be serving vegan beans to Beyoncé and watch her take a bite with a rock in it. So just rinse your beans. Add the rinsed and pebble-free beans to your pot and water to cover 3 or 4 inches over the level of the beans. Add one onion, sliced in half and peeled but leaving one end intact to hold it together. 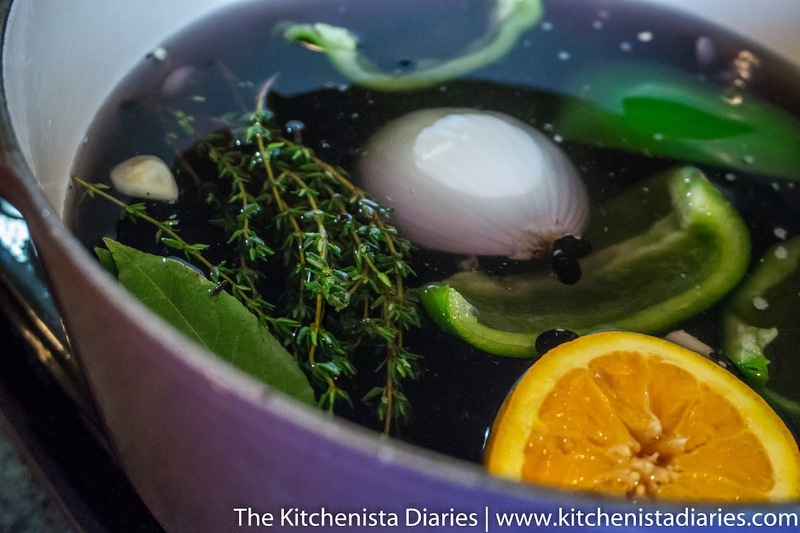 You'll also add the green pepper quarters, five of the garlic cloves, both bay leaves, and the orange half. If your thyme is all connected to a hearty sprig, go ahead and throw the whole thing in, otherwise I'd recommend tying it up with some twine or just picking off the leaves. It's a pain to dig through anything for stems later. You don't need to add anything else at this point, not even salt. 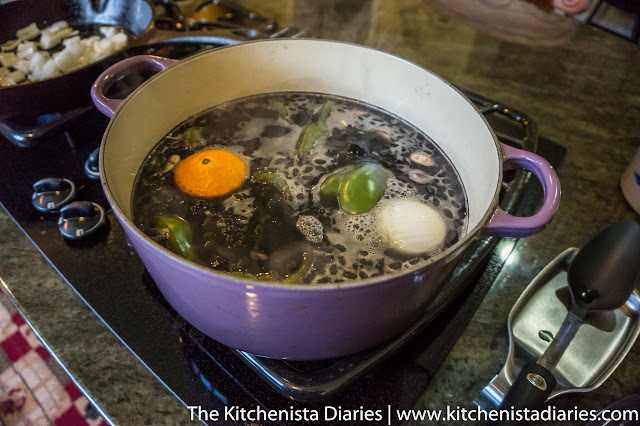 Bring the pot to a boil, then reduce to low heat, cover and let it simmer. Somewhere between one and two hours, the beans will soften. Your pot will look like scary sewer sludge. I removed the orange at this point so that the peel didn't add too much bitterness. The time it takes for your beans to get "al dente" could vary greatly depending on the integrity of your dried beans. You should be able to bite into them easily, but they are still not soft enough to serve at this point. Some of the skins do get blown out, and that's fine as half will get mashed up later on. 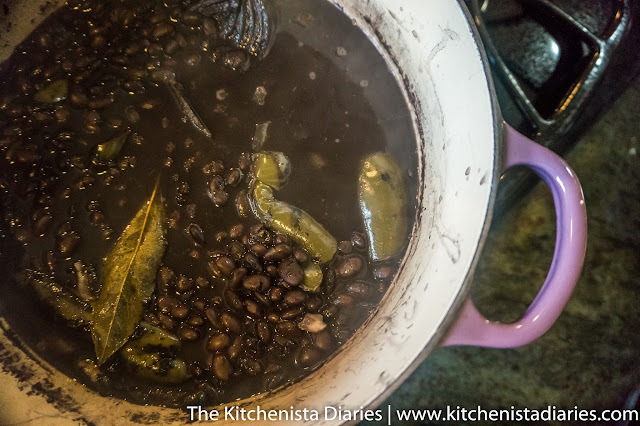 I stirred in about a teaspoon of kosher salt and let the beans simmer for another thirty minutes or so, uncovered. From this point forward the gravy needs to thicken which happens faster when liquid can easily evaporate. After two hours or so in, my beans were soft and ready to be seasoned up. I removed the green pepper skins, onion, thyme and bay leaf from the pot. It's okay to leave any bits of garlic in there, they will fall apart and/or get mashed up by the end of cooking. 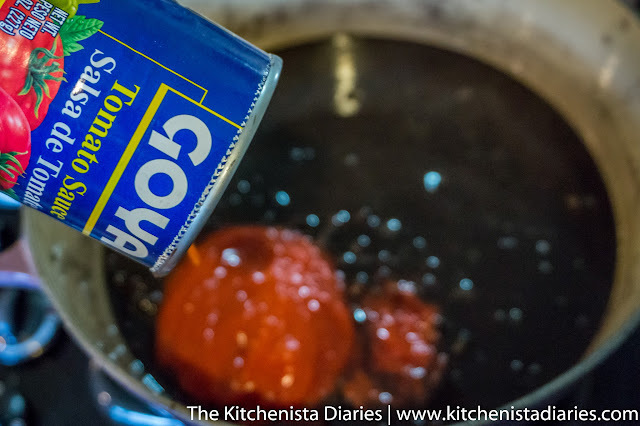 Next, I stirred in a bit more salt and my can of tomato sauce. I love this stuff. While the beans continued to simmer, I prepared a sofrito. This part is definitely where I learned a little bit from the Cuban preparation, although I use a few different ingredients in my sofrito. 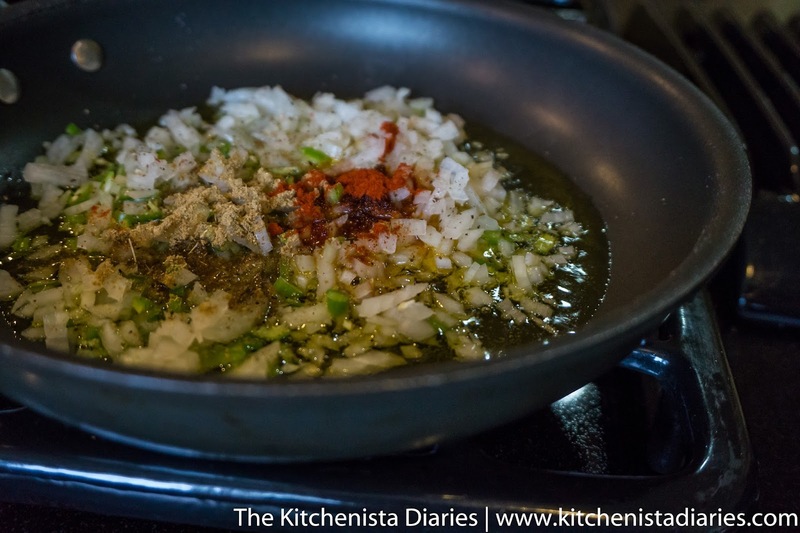 Add two tablespoons of olive oil to your skillet over medium low heat. Once warmed, add the remaining onion, finely diced, along with the diced serrano pepper. Season with a pinch of salt, cumin, smoked paprika and lots of cracked black pepper. Allow that to cook for a couple minutes until the onions soften. Next add the remaining five garlic cloves, finely minced, along with the dried oregano and chopped cilantro. 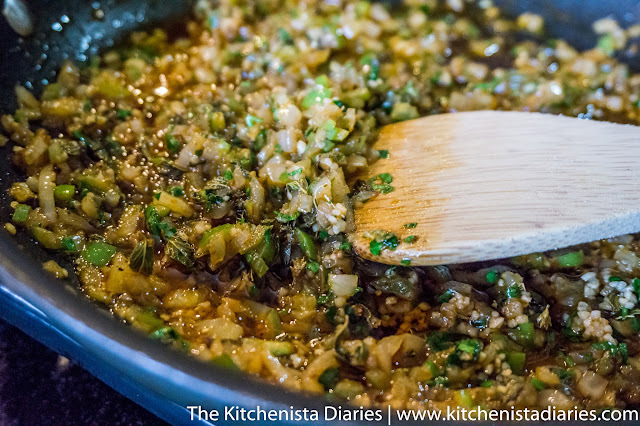 Reduce the heat to low and continue to gently cook the sofrito for another few minutes until it is aromatic and golden. Stir the sofrito into the pot of cooked black beans. 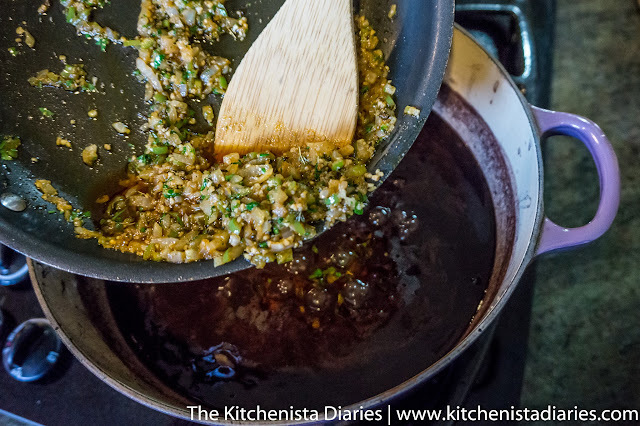 Allow it to simmer for another 15 minutes or so to absorb the flavors before tasting and making any adjustments for salt. I used a potato masher to partially crush the beans. 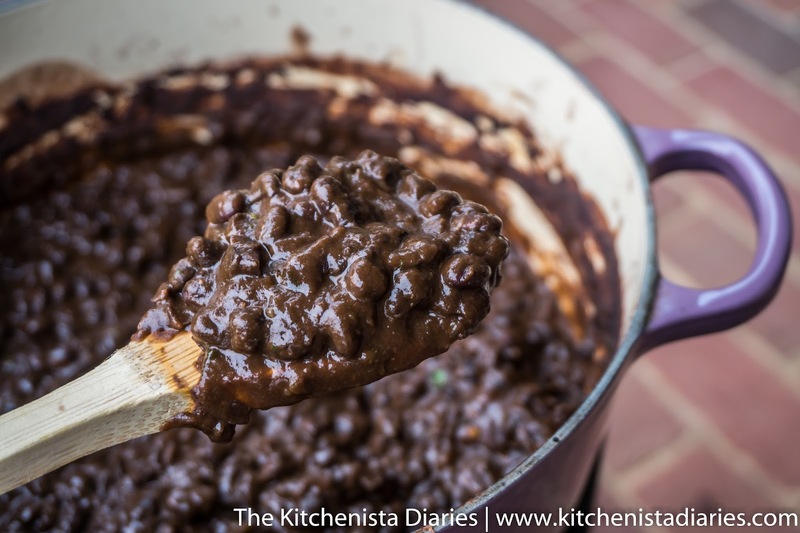 You don't want refried beans, but smashing them up a bit helps to thicken the gravy and makes a really great texture. 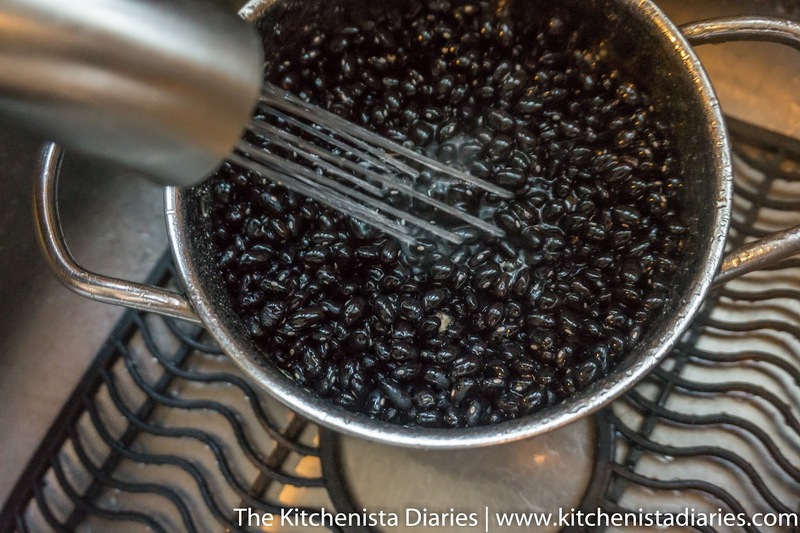 You'll end up with a mix of mostly whole beans, with the rest pureed and incorporated into the sauce. As you can see there is still quite a bit of liquid left in the pot. I let the beans simmer for another half an hour to get the gravy to the perfect consistency. My total cooking time is usually between three and four hours, give or take, This isn't something you can time exactly, so just be sure you have a lazy afternoon free and don't stress it. To finish things off, do one final check for salt and pepper, and stir in the remaining tablespoon or so of extra virgin olive oil, as well as the vinegar. Give it a minute, spoon some beans in a bowl for your first real taste, then be prepared to swear off cans for awhile. 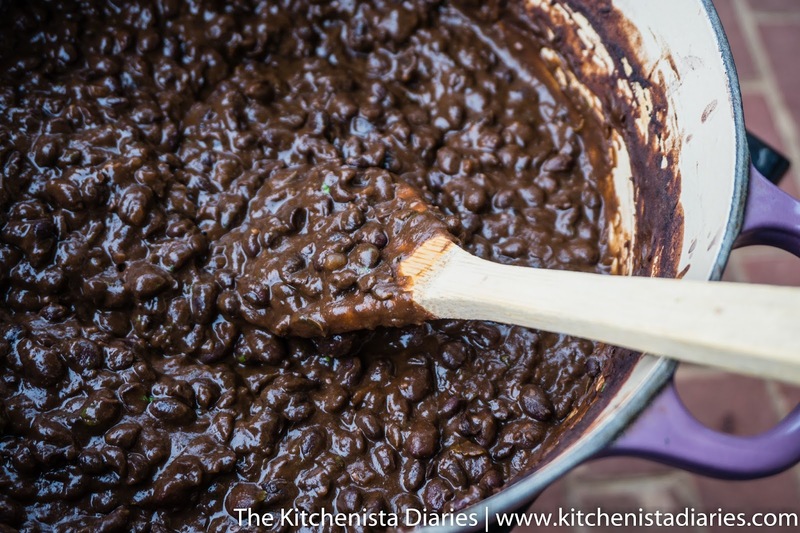 You just made a crazy delicious, creamy pot of seasoned black beans. 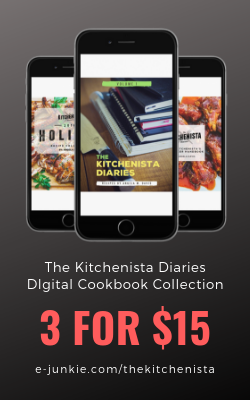 If this tutorial has helped you out in the kitchen, please consider donating a couple bucks to The Kitchenista Diaries and help fund future recipes! Thanks for your ongoing support!